BM2000 saw the appearance of an actual solar-powered sound system. It was a pretty simple affair: a cheesy Boss car amp powered by a substantial 12V marine battery topped up by a 40W solar panel. In practice we ended up using two marine batteries and charging one off the camp's generator while the other one was in use. The solar panel got some use about halfway through the event. It worked fine but needed attention every so often so that it was always facing the sun directly. "Cheesy" was the name of the game here. A couple of "Q-Power" PA speakers bought on a whim from EPO in Houston (one of those totally unpretentious hobby outlets where there's electronic bits everywhere and it's cheap and if you're nice they'll cut you a deal). Total cost: $120 or so for two. See 'em in the back of my car on the way back from EPO. Again, cheap & cheesy in effect here! 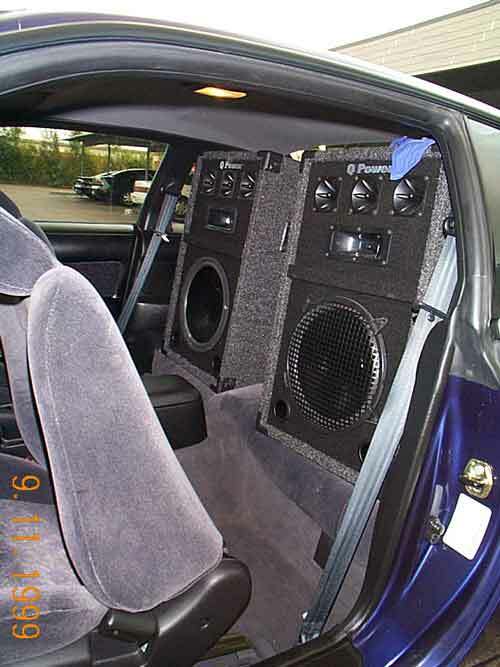 A standard used Boss car amp. Nothing special at all. Cost in the $50 ballpark. The only difficult bit would be finding one that wasn't knocked off... (thankfully mine wasn't). A marine battery is like a car battery but designed for continuous usage rather than just dumping a bucket load of juice for a few seconds cranking a car's motor. Since an amp is on drawing a more or less constant amount of power a marine battery is a good fit for this scenario. Another property of marine batteries is that they're designed to be fully discharged -- ordinary car batteries really aren't meant to be fully drained. If you run the sound at a reasonably loud party volume you'll be hauling some serious current (20 amps or more) from the batteries and if you plan on having the batteries any distance at all from amp make sure you use good quality thick wiring. For purchasing simplicity I just used speaker cable. It would be cheaper to use 30A wire intended for a house's electrical system. Cost: 20c/foot or thereabouts for the speaker wire. Best not to buy this from a flashy hi-fi store. Remember: you're out in the desert, and if you're anything like me every other component will be at best "OK" :-). Even the Hi-Fi mags say house mains wiring provides pretty adequate sound reproduction quality if you want to go this route. Feel free to email me, Paul makepeace.